Verbal communication with machines has been one of the main goals of computer science since its early days. In 1968, Arthur C. Clarke caught the imagination of half the planet with his novel 2001: A Space Odyssey, which was made into an enormously successful film by Stanley Kubrick in the same year as the book was launched. Computer science was still in its infancy; the first microprocessor had not even been developed. Still, the idea of artificial intelligence such as that of HAL 9000 had already seduced a generation, even though personal computers were still a thing of the future. From left to right: Aitor González Aguirre, Dr. LLuís Padró and Horacio Rodríguez Hontoria. 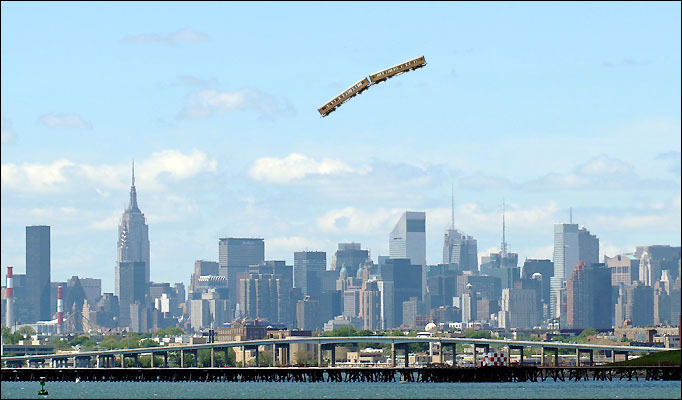 Yesterday I saw a plane flying over New York. Yesterday I saw a train flying over New York. Although the statements are exactly the same apart from one word, they have very different meanings. It is easy for us to imagine a plane flying over New York, but when we read the second statement we immediately realise that a train cannot fly. Consequently, we know that the meaning of this sentence is different. For example, it may be that a plane is flying over New York and the person inside the plane (because people cannot fly either) sees a train from the window. It is very difficult for computers to make these kinds of inferences, but relatively easy for people. Semantic textual similarity (STS) is a task that was introduced originally in SemEval 2012 to tackle one of the aspects of artificial intelligence that will enable machines to communicate naturally with people: evaluation of meaning. Knowledge of whether two original sentences have the same meaning or not is vital to good communication. However, meaning is not black and white: there is an entire spectrum of greys. The aim of STS is to automatically assess the similarity of two sentences on a scale from 0 to 5. Each band represents, in an easily understandable way, the differences that make two sentences equivalent or not. There are many techniques and resources for tackling this task, such as WordNet, Wikipedia and ontologies such as SUMO, which address many of the aforementioned difficulties, including polysemy, the identification of entities (including people and companies) and reasoning. However, these resources are created manually, which is a very expensive task in terms of the time required and the money. Recently, advances made via Deep Learning have led to new useful resources that have been generated automatically to improve STS systems. One of these is Word Embedding: a system that can map the semantic characteristics of words in a vector. Words with similar meanings are mapped closer to each other, and those that are different are further away. These new systems can analyse the context in which words appear in a very wide range of texts. Assuming that similar words appear in similar contexts, the system puts each of the words into an N-dimensional space, and maintains the premise that similar words should remain close to each other. When the vectors have been generated, we can calculate the similarity of the words by calculating the cosine of the vectors. The same vector that converts man into King, converts woman into Queen (figure 1). However, the most interesting characteristic of these vectors is that the meaning is preserved, so we can operate on them using additions and subtractions. For example, the result of the operation King-Man+Woman would be the same as Queen, or put another way, if the vector that codes the meaning of Man is taken away from the vector that means King and the vector for Woman is added, the result is the vector that means Queen (see Figure 1). These measures of equivalence of meaning are useful for many tools, for example, in the well-known Siri, the personal assistant for iOS, or to assess voice commands for automated systems for dwellings, so that the house can deduce that the phrase "I need more light" could mean "Put up the blinds" or "Turn on the lights", depending on how much light there is outside at the time. Other potential applications are assistance for the elderly, as in general people in this age range find it harder to learn and use voice commands, and assistance for teaching, where an STS system can assess whether a student’s response means the same as the correct response assigned by the teacher, which makes the task of teaching easier. Another very popular task is Question Answering (QA), an area in which our group is working actively. QA can be defined as a task in which the user asks a question in natural language and the system must give an answer (instead of different documents, which is what Google would do). The first QA systems tackled questions of a factual nature: Where was Obama born?, When did the Second World War end? Who discovered penicillin? Then, more complex questions were tackled, in which the response was not found in just one document, but needed to be built from partial components, for example: Who were the first three chancellors of the Federal Republic of Germany? ; questions related to definitions: Who was Picasso?, What is paracetamol used for? ; and questions on opinions, such as arguments for and against arms control in the USA. In parallel, restricted domain systems have been developed, as well as systems that seek a response not only in textual documents but also in structured sources, such as Linked Open Data repositories (FreeBase, DBPedia, BioPortal and others). In all of these systems, distance measures between the question and potential responses are used widely. One type of QA that has become fairly well-known is Community QA (CQA). In CQA, an initial question is asked by a member of the community. This activates a complex structure of interventions of members of the community who reply, give opinions, reconsider and refine, among other actions. This leads to the use of different measures of similarity between questions and other questions, between questions and answers, and between different answers, etc. Obviously, the measures are different for different sub-tasks. Recently, our group participated in a CQA competition as part of SemEval 2016 in which there was the added difficulty that texts in their original language, Arabic, were compared with their translation in English. Both STS and QA are partial approximations to Natural Language Understanding (NLU), which consists of a programme that reads a text and, on this basis, constructs a conceptual representation of its meaning. If two texts have the same meaning, or similar meanings, they will have similar conceptual representations. However, this representation could be used in other applications (such as translation and creating summaries). In the future, research will be carried out in this direction, which will combine Deep Learning and major semantic online resources for the automatic comprehension of language. Perhaps HAL is not so far away after all.